Provides an overview of the BPM lifecycle with the roles and results of business process modeling, the BPM Notation, and the most important BPM patterns. BPM (Business Process Management) is a set of related activities, such as process modeling and design, process execution, process monitoring, and process optimization. 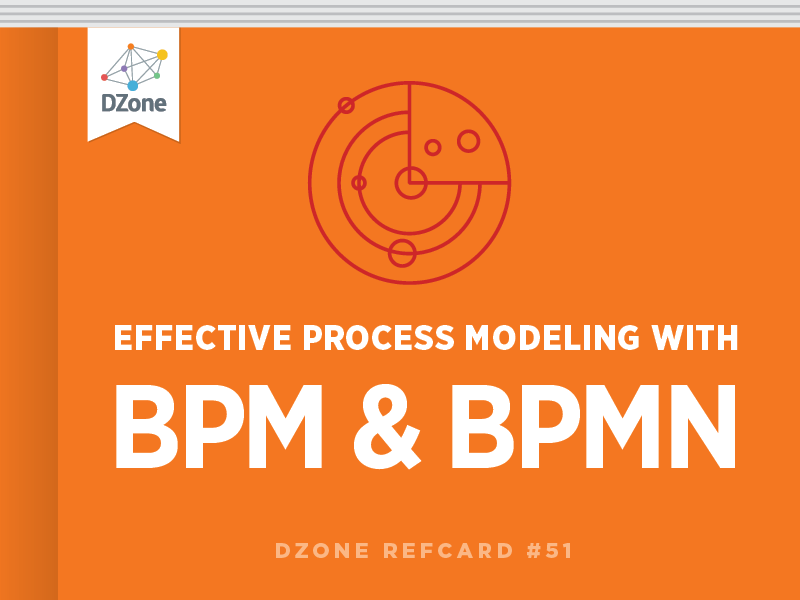 This Refcard provides an overview of the BPM lifecycle together with the roles and results of business process modeling. It gives an overview of the BPMN (Business Process Modeling Notation) and presents the most important BPM patterns. Process modeling - definition of the process models using the selected methodology and notation (such as BPMN). Process implementation – implementation of end-to-end IT support for the process. SOA provides technologies and tools to make the implementation phase quick and efficient. Process execution and monitoring – execution of the process and monitoring of the process to gather the Key Performance Indicators (KPI). Process simulation – simulated execution of the process with the objective gathering KPIs and identifying optimization points. Process optimization – improving the process efficiency, effectiveness, agility, flexibility, and transparence. KPIs are financial and non-financial metrics used to help an organization define and measure process efficiency. Examples of a KPI are “Average revenue per customer”, “Average time for response to a customer call”, “ Average order amount”, etc. Business activity monitoring (BAM) is real-time observation of key performance indicators. Why do we Model Business Processes? Design new business processes Focus on business goals, KPIs, customer needs, and business partner expectations. Model existing business processes Assure the right flow of activities. Identify normal flows and possible exceptional flows. Identify inputs and outputs of activities. Identify key documents and sources. Restructure existing business processes Focus on the activities and their added value. Focus on lines of business and their relations. Model responsibilities and roles. Development of endto-end IT support for business processes Detailed modeling of process flow. Who should take part in process modeling? Line of Business Expert Good, in-depth knowledge of the process. Moderator Responsible for the meeting, for asking questions for leading the discussion into the right direction. Modeling Expert Responsible for design the process model (during and after the meeting). QA Owner Responsible for the alignment of processes in aspect of total quality management. Top-down We start with the process architecture. First we identify the major process activities and their flow. Then we model each activity into more detail. High level process modeling requires good knowledge about the process and some experience. Modeling lower levels can reveal inconsistencies on higher-levels. Bottom-up We start with the identification of activities. We model sub processes and business transactions and merge them into processes. We get lost in the details. Getting overview of processes and their relations can become very difficult. We can focus on too many details. Inside-out We start with core processes. We expand them with adding support processes around core processes. It can be difficult to identify core processes and how to progress into the right direction. The Inside-out approach is usually the most pragmatic approach to prcess modeling. Provide a brief explanation of why it is the most pragmatic approach. As-Is model We model the process as it is currently executed. Knowing the current as-is state is necessary for any future optimizations. We need to clarify whether we will model the process as it should be performed, or as it is performed in reality. Often there are significant differences between the two. When we model the as-is process we should not make on-the-fly modifications - not even those which seem obvious. We should however make notes of all possible modifications for the to-be process model. BPMN (Business Process Modeling Notation) is a graphical notation for business process modeling. The objective of BPMN is to support business process modeling for business and technical users. It provides a notation that is intuitive yet able to represent complex process semantics. BPMN is maintained by the Object Management Group. Activities: they represent the work performed within a business process (see Figure 4). Gateways: they represent how a sequence flow diverges or converges in a business process (see Figure 5). Events: they depict that something happens in a business process (see Figure 6). Connecting objects are used to connect flow objects to each other and to other information. There are three categories of connecting objects: Sequence flow ( see Figure 7), Message flow ( see Figure 9), Association ( see Figure 11). Defines the order of execution of flow objects. Sequence flow with a condition (conditional flow). Default flow, which is chosen if none of the conditions are satisfied. Shows the flow of messages between two entities. An activity starts after completion of another activity. Activities are connected by a sequence flow directed towards the subsequent activity. Workflow Pattern Description: A path diverges into two or more parallel subsequent paths. The subsequent paths execute concurrently. We use a parallel gateway to divide a sequence flow into several sequence flows. We use an expanded sub-process in which we place the activities to be performed in parallel. We use an inclusive gateway with equivalent conditions. Example 1: After receiving payment for the order we prepare the ordered items for shipment and issue the receipt concurrently. subsequent path is enabled when all the preceding paths complete (and-join). We use a parallel gateway to merge several sequence flows into a single flow. The outgoing flow activates when all the incoming sequence flows are enabled. We use an expanded sub-process in which we place the activites to be performed in parallel. Expanded sub-process completes after all the activities it contains complete. the package to the customer. Solution 1: Synchronization using a parallel gateway. Solution 2: Synchronization using an expanded sub-process. the incoming path is enabled exactly one of the subsequent paths is selected and enabled. BPMN: We use an exclusive gateway. We use an exclusive merge gateway to merge alternative paths. We use a flow object with two or more incoming sequence flows. The incoming sequence flows represent the ends of alternative paths. Any one of the incoming sequence flows trigger the flow object. Note: The behavior is the same in both cases provided that the incoming sequence flows are alternative. Example: The two alternative paths used to calculate the final price of the ordered items are merged using the exclusive merge or by sequence flows leading to the “Check Inventory” task. more subsequent paths may be executed. We use an inclusive gateway. We use a collection of contidional sequence flows. We use a complex gateway. via e-mail, by regular mail or both. Example solutions 1 nd 2 represent equivalent behavior. list may concern one or more departments. subsequent branches can be executed. Workflow Pattern Description: Two or more paths converge into a single subsequent path. Several incoming paths may be enabled, in which case they are synchronized before the subsequent path is activated. In different process instances different number of incoming paths may be taken. BPMN: We use an inclusive gateway. the order via e-mail, by regular mail or both. Workflow Pattern Description: Two or more paths converge into a single subsequent path. Each Incoming path activates the subsequent path. BPMN: We use sequential flow for every ending of a converging path directed towards the flow object of the beginning of the subsequent path. Workflow Pattern Description: Loops that have more than one entry or exit points. BPMN: Sequence flow connected to an upstream activity. Workflow Pattern Description: A task or a subprocess is repeated while or until some condition is true. to model an “until” loop we set the value of the attribute TestTime to “After”. Workflow Pattern Description: Multiple instances of a task or a subprocess are created. They run concurrently and are not synchronized on completion. Workflow Pattern Description: Multiple instances of a task or a subprocess are created. The number of instances is known at design time. They run concurrently and are synchronized at completion before the process continues. we set the value of the MI_FlowCondition attribute to “All”. approval by 3 eligible employees. Multiple Instances with a Priori Run-Time KnowledgeWorkflow Pattern Description: Multiple instances of a task or a subprocess are created. The number of instances depends on various run-time factors. Instances run concurrently and are synchronized at completion before the process continues. Workflow Pattern Description: Multiple instances of a task or a subprocess are created. The number of instances depends on various run-time factors. Instances run concurrently and are synchronized at completion before the process continues. Workflow Pattern Description: A process or a subprocess instance terminates when there is nothing else to be done and it is not deadlocked. The instance has completed successfully. We end every path of the process or subprocess with an end event. If we use a start event we must use at least one end event. An end of a path in the process is indicated by a flow object without an outgoing sequence flow. The process completes when all tokens that were generated for the instance are consumed. Note: We must either conclude all paths with an end event (with an exception of compensation activities) or not use end event for the given process/subprocess. Example: In the example process there are two alternative paths that the process instance can take. If the order cannot be fulfilled, the customer is notified. After this the end event is reached and the process completes. If the order can be fulfilled several activities take place and ordered items are shipped. After this the process reaches an end event and completes. Workflow Pattern Description: Aprocess or subprocess terminates and the remaining work is cancelled. BPMN: We use a terminate end event. Example: In the example, the process splits into two parallel paths after order analysis. BPM is essential for continuous improvement of business process efficiency and effectiveness with the overall goal to produce business results faster, cheaper, better. This Refcard has provided the overview of the BPM lifecycle, presented the BPMN notation and demonstrated the most important patterns. M.B. Juric, R. Loganathan, P. Sarang, F. Jennings: SOA Approach to Integration, November 2007. OMG: Business Process Modeling Notation (BPMN), Version 1.2, January 2009. M.B. Juric, P. Sarang, B. Mathew: Business Process Execution Language for Web Services 2nd Edition, January 2006. H. Gaur, M. Zirn, et al. : BPEL Cookbook: Best Practices for SOAbased integration and composite applications development, July 2006. Wil van der Aalst, Arthur ter Hofstede, et al. : Workflow Patterns, http://www.workflowpatterns.com/. Don't Model Business Behavior in Objects! Microservices, Verticals, and Business Process Management? \n Model existing business processes \n Assure the right flow of activities. Identify normal flows and possible exceptional flows. \n Development of endto-end IT support for business processes \n Detailed modeling of process flow. \n Solution 1: Synchronization using a parallel gateway. \n Solution 2: Synchronization using an expanded sub-process. \n Example: In the example process there are two alternative paths that the process instance can take. If the order cannot be fulfilled, the customer is notified. After this the end event is reached and the process completes. If the order can be fulfilled several activities take place and ordered items are shipped. After this the process reaches an end event and completes. \n Example: In the example, the process splits into two parallel paths after order analysis.